1. Inside your poems a lyric soul coexists with a narrative one, so different impulses are interwoven in verses ….do they go parallel or do they feed each other? You’re right that they are different impulses—the urge to express an emotion in beautiful language vs. the need to say what happened—but they aren’t mutually exclusive. I actually see them as part of a spectrum or continuum, with extreme lyric at one and perhaps straight chronological narrative at the other end. You can write a poem from anywhere on that spectrum. Mine tend to be somewhere in the middle, but some poems will be closer to the lyric end while others will move closer to the narrative end. My old teacher Stanley Plumly writes about this in his essay “Narrative Values, Lyric Imperatives” (in his prose book Argument and Song)—both how narrative (though probably not straight narrative) is necessary to the lyric (to keep the poem moving), as well as the idea that most poems have a narrative source but can be written from somewhere close to that source or from further away from the source (i.e., more lyrically). The poet Ellen Bryant Voigt also has some interesting things to say about narrative and lyric in her book The Flexible Lyric. She tends to highlight the differences between lyric and narrative—especially the idea that they have entirely different structures—but also points out that, in lyric, the narrative becomes “back story,” conveyed indirectly through the voice of the poem’s speaker (who in a sense is a character in the story). That idea seems to fit with Plumly’s notion of the narrative source and also with my sense of the lyric/narrative spectrum. It is probably voice, or tone, that seamlessly holds the lyric and narrative modes together—because the voice both tells the story and conveys the emotion. 2. No doubt there are so many links connecting your five poetry collections and that’s why we can talk about them being ‘memor-like’…. Can we consider them as real parts of just a “canzoniere”? You are not the first person to make this observation about the connection between my books. What may surprise you is that, unlike some poets (I believe Louise Glück is an example) I don’t even think of my individual books as a whole while I’m writing the poems—or at least not until later in the process. For better or worse, I write the poems I am moved to write as they come to me, one at a time… though sometimes one will lead to another. Then, when I have enough poems, I’ll look for an organic way to arrange the book as a whole, some kind of arc or set of organizing principles. I am never thinking about how one book relates to another. Even so, I can understand how, when a reader steps back and considers all the books together, they may seem to follow one from the other, like sections of a poetic memoir. This effect, I think, has to do with the kind of poems I tend to write—which, for the most part, are poems that come out of an actual life. So the books feel—and, in some sense, are—accounts of my life during the period when they were written. For example, Incomplete Knowledge, my fourth book, contains a lot of poems about my brother’s suicide, and there are a few more of those in my most recent book, Into Daylight. In fact, there is one poem in Into Daylight (the sestina “Essay on a Recurring Theme”) that actually comments on the poems in Incomplete Knowledge—that is an exception for me. In a broader sense, Into Daylight is not a book about my brother’s suicide but a book about the decade after—the next chapter, so to speak. But within that chapter there are a lot of different kinds of poems: love poems, poems inspired by other writers, poems about the natural world, etc. What connects them all, again, may be a sensibility, a voice. 3. Now let’s talk about your latest collection Into Daylight (Tupelo press, 2014) which introduces itself through a very evocative cover….how was this book born and what do its poetic materials consist of? After I wrote all the poems about my brother’s suicide that appear in the second half of Incomplete Knowledge, I had no idea where to go next. What could I write after writing those poems of intense grief? I answered that question very slowly, poem by poem. It turned out that I had a little more to say about my brother, but also about a lot of other things. Most of the poems in Into Daylight (especially after the first section) have nothing to do with my brother’s death, though his absence may hover behind some of the poems that are not explicitly about him. If the book is about anything, it’s about reconnecting with the world, with perception, and with poetry during the decade after my brother’s death—of finding again my proper relationship with the world, of rediscovering delight even while giving voice to pain and sadness. You mentioned the cover, so I thought I would say something about the way the book’s title and the cover play off each other. The title suggests a movement out of darkness and into the light. The cover image, with its gloomy beauty, captures that movement in the early or middle stages—no longer in darkness, but not yet in the full light, either—whereas the title emphasizes a later stage of the process, of actually coming into the light. I had imagined a brighter cover image, perhaps a blue sky full of big clouds, like something out of Van Ruisdael, so I was at first resistant to that foggy snow scene. But I came to feel that the discrepancy between the title and the cover created an interesting tension. 4.The American poets: who do you consider a master of yours or a travel-mate? 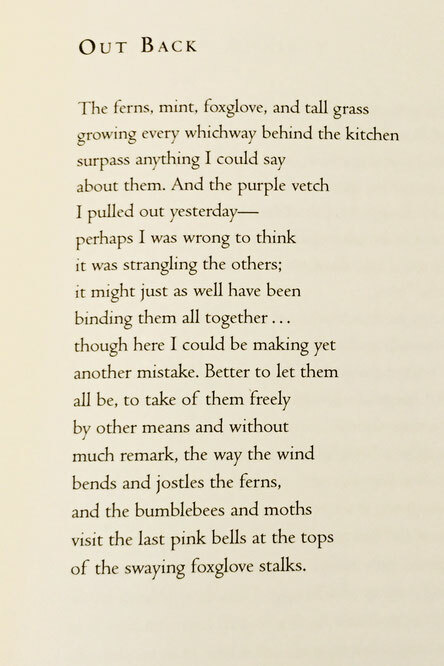 One of my favorite poets—a real touchstone for me—has always been Elizabeth Bishop. I read her in my early twenties and felt instantly that her distinctive, natural voice was speaking directly to me. Now of course she is famous and there is a whole critical industry around her work, but at that point she was like a well-kept secret—it was her friend Robert Lowell who was famous. After her, there are too many to name, and I know I would probably forget some, so maybe I’ll leave it there. 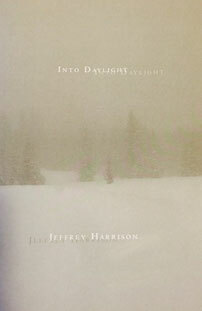 But I will say that Into Daylight contains a number of references and homages to other writers (including Robert Frost, Whitman, Richard Wilbur, and Mark Strand), but many of them aren’t American (John Clare, Hopkins, Han Shan, Catullus, Edward Thomas, Tolstoy, Virginia Woolf, etc.). 5.…and referring the Italian scene, which poets can’t you give up reading? Recently you spent some weeks in Liguria, a beautiful Italian landscape…. I’m ashamed to say that my familiarity with Italian poetry is not what it should be, though I did start early, in college. I went to Columbia, where Dante’s Inferno was a permanent part of the syllabus. (Later, I read the rest of the Divine Comedy.) I also took a class called “The Italian Sonnet,” which included the Vita Nuova, Petrarch, Michelangelo, and many others. The modern Italian poet I’ve returned to most is Montale, and I took him with me to Bogliasco, so I could reread him “on location.” There were details from his poems all around me, starting with lemon trees in the garden below my room (as in his poem “I Limone”) and including a wall topped with broken glass along the lane I had to walk down to get into town (like the one in his poem “The Wall”). I ended up writing a little poem about that experience, beginning with those shards of glass and ending with the tiny beads of smooth glass I found hidden among the rocks on the beach. 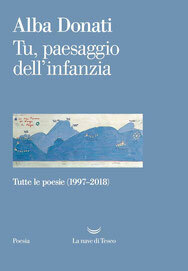 I also took a huge anthology of twentieth-century Italian poetry with me, and I reread poets I’d read before, like Ungaretti and Pavese, as well as ones I’d never read, like Giorgio Caproni, Pasolini, and Umberto Saba. 6.What do you think about the role of the poetry inside the contemporary environment? It’s complicated. More people are reading and writing poetry than ever before, but in terms of society as a whole, it has never been more ignored. It doesn’t help that the dominant mode in America right now tends toward ironic obfuscation—as if the poets had abdicated any attempt to communicate and lived in fear of encountering an actual emotion. This only further marginalizes poetry. On the other hand, poetry can’t compete against mass media and probably shouldn’t try. It will be kept alive by those who are still engaged in the perhaps old-fashioned (or is it timeless?) struggle to say the unsayable and create beauty in the process. From Into Daylight (Tupelo Press, 2014). and blinding, even with these sunglasses. her dog on an overpass as a body floats below. part of the brain. We would probably go crazy. to their diminished vision of the world. golden pollen tumbling off the swab. haven’t found them, and I’m not waiting around. organs are hidden.” Of course they are. when the flame makes contact with the source. From Feeding the Fire (Sarabande Books, 2001). listening to you blather on about your latest prize. train stations, even once in the Luxembourg Gardens. your fork dwarfing the Matterhorn. where I took them. It was my mission that summer. made me a writer. Not you, your fork. You are still the worst teacher I ever had. You should have been fired but instead got tenure. and I realized I don’t need it any more. I am returning it to you with this letter. 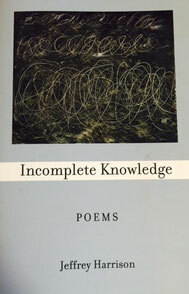 From Incomplete Knowledge (Four Way Books, 2006). lupines are named after wolves . 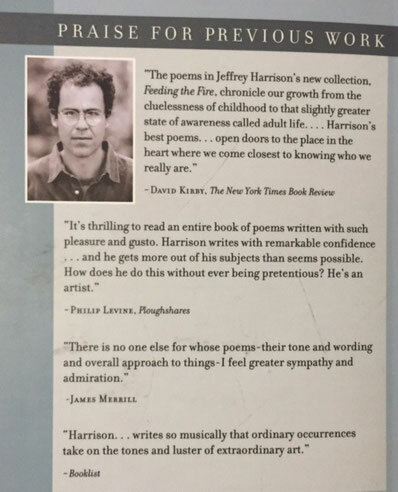 . .
Jeffrey Harrison is the author of several collections of poetry, including Incomplete Knowledge (2006), a runner-up for the Poets’ Prize; Feeding the Fire (2001); and The Singing Underneath (1988), chosen by James Merrill for the National Poetry Series. Harrison’s honors include the Lavan Younger Poets Award from the Academy of American Poets, the Amy Lowell Traveling Poetry Scholarship, two Pushcart Prizes, and fellowships from the National Endowment for the Arts and the John Simon Guggenheim Memorial Foundation. Harrison has taught at George Washington University, Phillips Academy, the University of Southern Maine, and Framingham State University. He lives in Massachusetts..